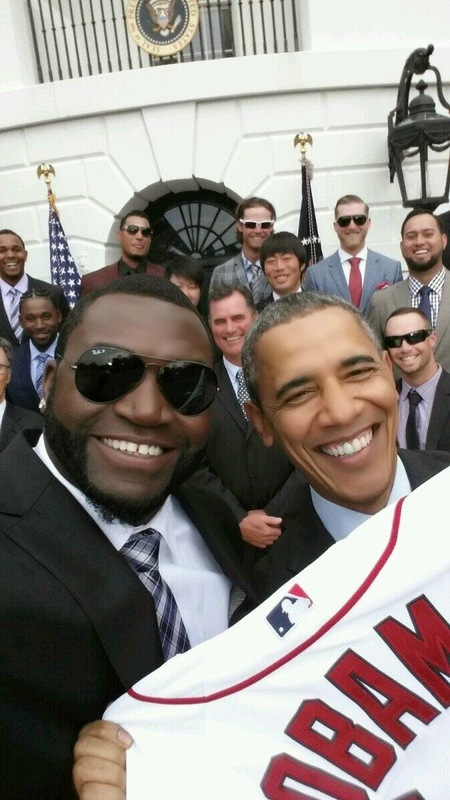 Yesterday we caught up with the 2013 World Series Champion Boston Red Sox as they headed to visit President Obama. They boarded the bus, headed out to visit with President Obama arriving around 09:30 AM and had a grand ol' time that was pretty much topped by David Ortiz being called 'Big Pappi' by the President himself. This was closely followed by a Big Pappi selfi with the President which was a once in a lifetime chance that he did not miss, much like he did not miss many pitches during the World Series. There was a storm of amazing pictures, tweets, and a short clip of the President speaking with the entire Red Sox team in front of The White House on the South Lawn. Here are a some of the best with the President's speech first. A sight to remember for all Red Sox fans. Hugs for President Obama and a jersey too. The boys that owned the hill in 2013. Dressed to impress or an embarrassment as some have suggested, you make the call. The one and only Jenny Dell got in the shot a time or two with Will Middlebrooks. A classic for the ages, this should be at the Hall of Fame when Ortiz is inducted.